Another big "Thank you" to our team that made our VFX shots on Cloud Atlas possible. To all those pixel pushers, modellers, texturers, sculptors, animators, simulators, compositors, producers, coordinators, painters, rotoscopers, riggers, lighters and shaders. That's all you. 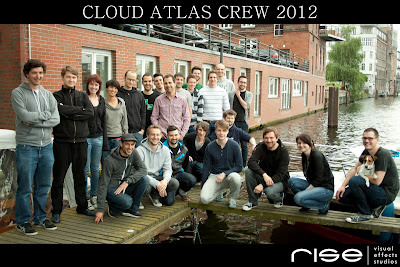 And to those who didn't make it on the picture like Robert, Tom, Christian, Ingo, Daniel, Kariem, Sergej, Heiko, Julian, Anton, Max, Andreas, Lars, Maxi, Korbi and Patrick. Thank you!